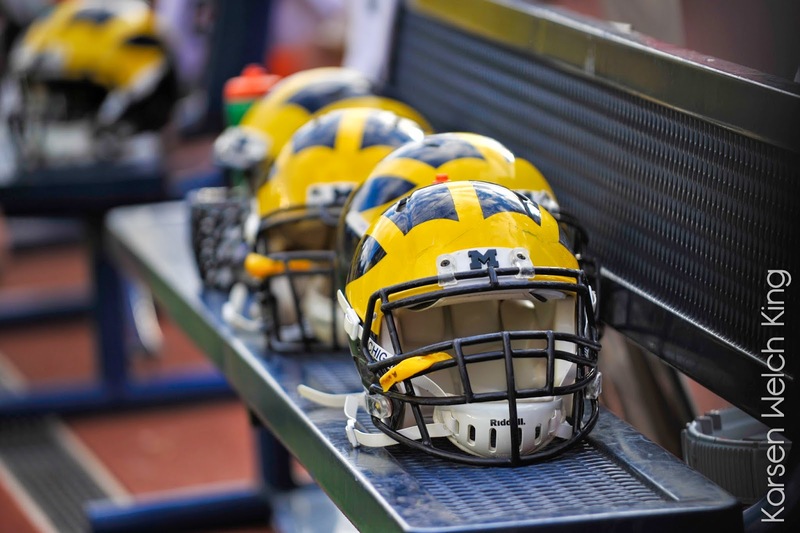 For the second week in a row Michigan lost a commitment from their 2015 class. Who was it? Two Michigan recruits have booked official visits to other schools. Which schools will they be visiting? Find out in this Fridays version of "The Future Huddle". On Thursday night, the 2015 Michigan recruiting class got even smaller as Linebacker Darrin Kirkland Jr. took to twitter to announce that he is opening up his recruitment again. This is a huge blow to Michigan’s recruiting class, as Kirkland is the only linebacker Michigan had a commitment from. Later on in the night, ESPN’s Tom VanHaaren reported that the Wolverines would also not be reconsidered in Darrin’s recruitment going forward. With Kirkland boasting a very impressive offer list, he could go to any school in the country that he chooses to, but will more than likely decide between Oklahoma, Texas, Ole Miss, and USC. Personally, I think Kirkland Jr. ends up in Oxford playing his collegiate career for Ole Miss. Kirkland Jr. becomes the sixth player to decommit from Michigan’s class joining George Campbell, Damien Harris, Shaun Crawford, Darian Roseboro, and Garrett Taylor. The situation in Ann Arbor is getting very ugly with all the decommitments, and it’s to the point where even other schools recruits are taking notice. So where does Michigan turn to now for their next Linebacker? As of right now, it doesn't look good for the coaching staff, as most of their linebacker targets in 2015 have already committed to other schools (Bilal, Hilliard, McMillon, Barajas), or have seen their interest decrease as the year has progressed (Masina, Holland). Although the coaching staff will likely extend offers to some in-state recruits, the chances that Michigan dosen’t take a linebacker in this year’s class are very real. At this point, I would say that it’s Keisean Lucier-South or bust. Mike Weber scheduled official visits for USC, Miami, Michigan State, and Ohio State earlier this week. Like most Michigan commits this year, Weber is keeping all his options open in case Brady Hoke is fired at the end of the year. While I think Ohio State and Miami are long shots to flip the 4* product, you can't count out USC or Michigan State. USC was making a major push for Weber's services before he committed to Michigan in August, and it looked at one point that they might have became his leader. Michigan State is another attractive spot for Weber to land if he does decide to decommit. He can stay in-state to be near his family, and still play for a Top 10 team. Although Michigan will have to fight off these four schools, at this moment, I think Weber will stick out his commitment and end up playing in Ann Arbor for his collegiate career. Brian Cole will visit Purdue this weekend for an official visit. I don’t foresee Purdue being a threat to land Cole, and the trip is probably just Cole keeping all his options open in case he does decide to decommit at some point. His high school coach is also a Purdue graduate, so that may be another reason Cole is visiting. Brian will also make the trip to Lincoln on November 22nd, for an official visit to Nebraska. Like Weber, I think Cole will sign his name on a Michigan Letter of Intent when National Signing Day arrives. 2015 Defensive End/Outside Linebacker target Keisean Lucier-South was in Oregon last weekend for an official visit. According to 24/7’s Justin Hopkins, the visit went over extremely well, with Keisean giving the visit an A+ grade. 2015 Safety Rashad Roundtree committed to Georgia on Friday morning. Michigan offered him a scholarship last May. 201 OL Thiyo Lukusa released a Top Six on Monday, which did not feature the Wolverines. Thiyo is currently ranked as the #24 Offensive Lineman in the nation according to 24/7 Sports. 2016 DE Target Khalid Kareem picked up an offer from Miami on THURSDAY? His recruitment has seen a major boost in momentum the past couple weeks, picking up offers from Duke, Louisville, Vanderbilt, Pittsburgh, Cal, Iowa, and Wake Forest. I think a Michigan offer could be imminent for Khalid. 2016 DB target Lavert Hill tweeted out this photo he was sent from the Michigan coaching staff on Thursday. 2016 WR target Donnie Corley was also sent a similar photo earlier this week. Have to hand it to the Michigan PR department, as these are some of the better photoshopped recruiting photos I've seen.